Background: Red bull has been known as a healthy drink within many populations. The chemical composition of energy drinks can produce multiple adverse effects, including serious behavioral effects. Objective: To study the effect of energy drinks (Red Bull) on brain, liver, kidney, and heart in rabbits. Methods: thirty males albino rabbits were used, animals divided into 3 groups (A, B, and C), each group contain 10 rabbits. Group A treated with high dose of red bull (10 cc), Group B treated with low dose (5 cc), and Group C is control group. 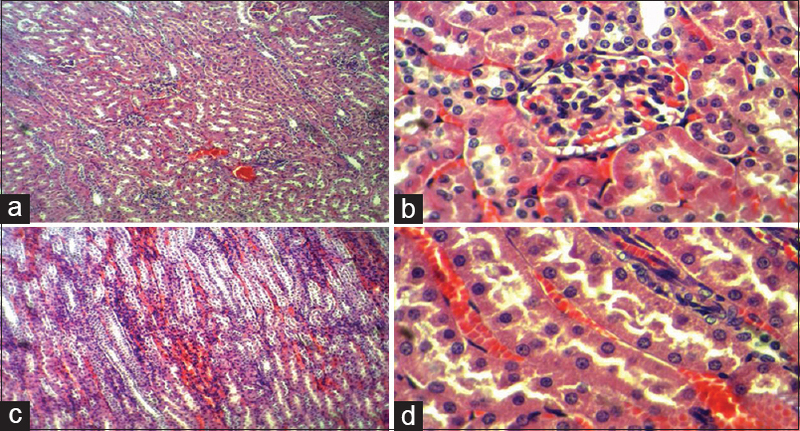 Results: The results showed that control group had no any pathological changes while both Groups A and B showed many pathological changes, Group A showed renal vascular congestion, hemorrhage of interstitial tissue, focal atrophy, and degeneration of lining epithelium of proximal and distal convoluted tubules, while Group B showed renal vascular congestion, glomerular capillary congestion, hemorrhage of interstitial tissue with swelling of lining epithelium of proximal and distal convoluted tubules that appeared as pale cytoplasm with star-shaped lumen, and swelling of glomeruli; this reveals that there is dose–response relationship between treated groups with low and high dose of red bull. Conclusion: Energy drinks have dose–response relationship with adverse effect; it has become apparent that the consumption of these energy drinks will seriously harm the body. Simple sugars are metabolized by the body and produce a quick energy burst, followed by a deep energy deficit. High intake of sugar raises blood fat levels and leeches essential minerals such as copper, chromium, and zinc from the body, leading to deficiency diseases, immune system impairment, and even insulin resistance. In animals, taurine can produce a decrease in body weight (a sign of toxicity) and dehydration. In rats and guinea pigs, high intake is associated with liver dysfunction. Small doses of taurine can enhance the toxicity of industrial pollutants such as carbon tetrachloride. It is a naturally occurring substance manufactured by the human body. Rats metabolize this substance differently from humans and other mammals. Caffeine is a stimulant which increases heart rate and blood pressure and raises the level of harmful stress hormones in the bloodstream. In high doses, caffeine is dehydrating, addictive and can reduce adrenal function and the body's immune response. In pregnant women, high caffeine intake is associated with increased risk of miscarriage. Synthetic flavorings can be mixes of several industrial chemicals and it can be considered as neurotoxins, allergens, and potential carcinogens. Caramel produced by ammonia process is a common food coloring. This type of coloring has been associated with blood toxicity in rats. There is evidence that it may damage genes and cause enlargement of the intestines and kidneys. Thirty male albino rabbits were chosen in this experiment; all the animals were kept in properly cages with suitable environment in laboratory animals and fed a balance diet provided with Vitamin C and drunk enough amount of water during all the period of experiment; after 1 week of the settlement, all the animals were weighed. The rate of the animals weights was 500 g–1.3 kg, all the animals were divided into three groups, each group contain 10 rabbits (A, B, C), two groups (A and B) for dosage groups, and the last group (C) for the control. The Group A (high dosage) group contain ten rabbits, all of them administrated with Red Bull (10 ml) by gavage needle for 30 days. The other group (Group B) (low dosage) contains ten rabbits administrated with Red Bull (5 ml) by gavage needle for 30 days. While for the control group were administrated distal water during all the period of the study which is 30 days. After the end term of the experiment, each animal in all groups were killed by a high dose of general anesthesia with ketamine (35 mg/kg) and xylazine (5 mg/kg) given I/M. 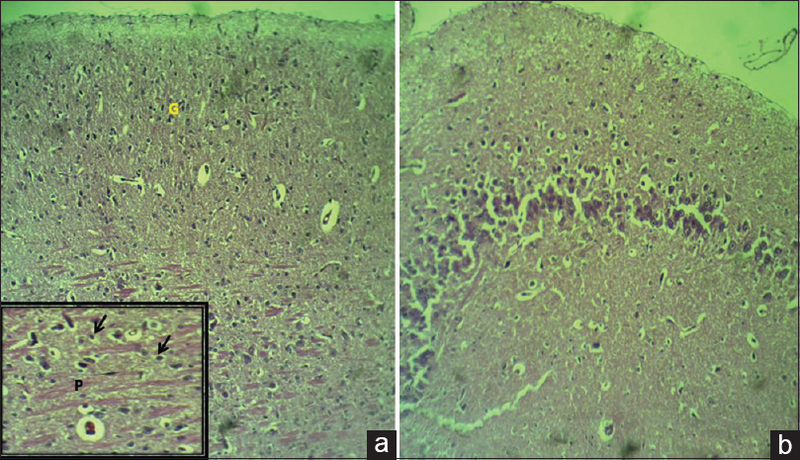 Organs such as liver, brain, kidney and heart were isolated and putted in formalin 10% for 24 h, followed the automated tissue processing for preparation the slides all the slides were stained with Hematoxylin and Eosin stain. 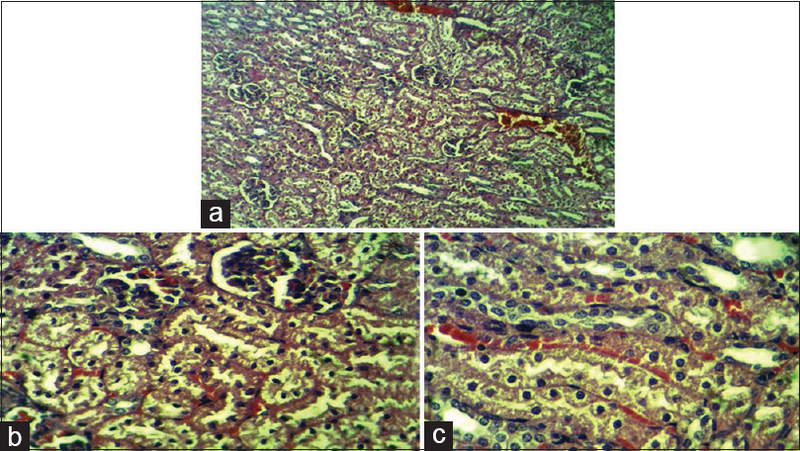 The results showed that control group [Figure 1] had no any pathological changes while both group A and B showed many pathological changes [Figure 2] and [Figure 3], group A showed renal vascular congestion, hemorrage of interstitial tissue, focal atrophy and degeneration of lining epithelium of proximal and distal convoluted tubules while group B showed renal vascular congestion that appeared as pale cytoplasm with star shaped lumen and swelling of glomeruli. 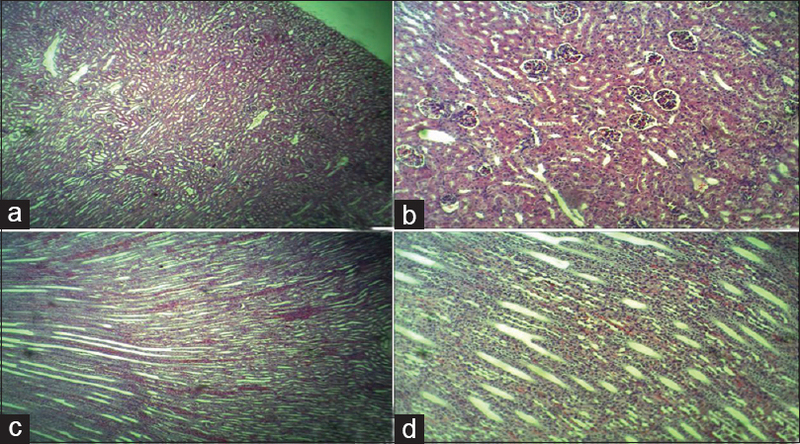 [Figure 4] showed normal liver structure in control group while [Figure 5] and [Figure 6] show abnormal changes due to harmful effect of red bull like congestion of sinusoidal swelling of hepatocyte and many centrilobular leukocyte infiltration. 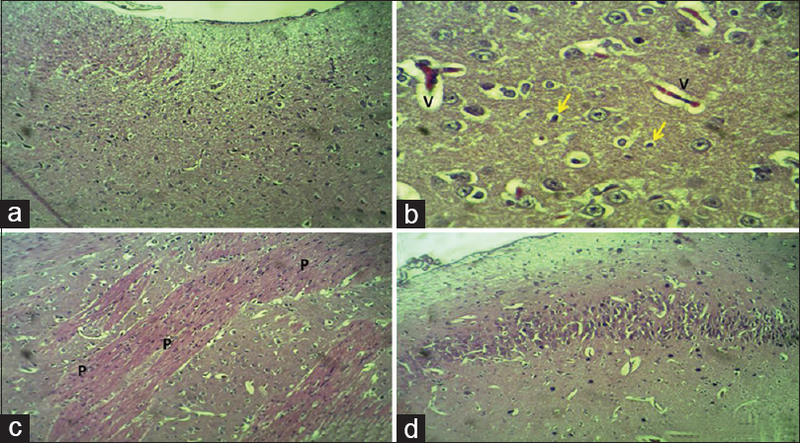 The results showed that the brain in control group had no any pathological changes [Figure 7] while [Figure 8] and [Figure 9] showed the effect of red bull on the rabbits brain and caused neuronal degeneration and aggregation of focal plaque. 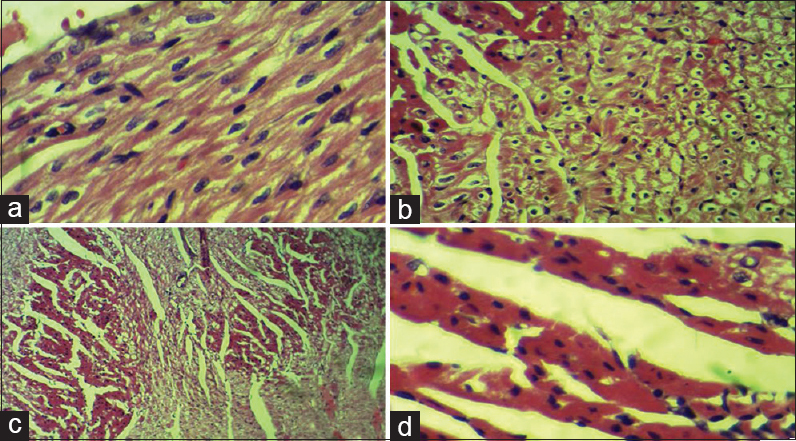 The results also showed that the rabbit heart in control group had no any pathological changes [Figure 10] while [Figure 11] and [Figure 12] showed the effect of treatment with red bull on heart and caused mild muscle necrosis and edema of purkinjie fibers. Red bull drinks have many side effects and each 250 ml or a can of Red Bull contains the following: 1000 mg of taurine, 600 mg of glucuronolactone, 80 mg of caffeine, 18 mg of niacin (niacinamide), 2 mg of Vitamin B6, 6 mg of pantothenic acid (calcium d-pantothenate), Vitamin B2 (riboflavin), Vitamin B12 (cyanocobalamine), inositol, and nonmedicinal ingredients: carbonated water, sucrose, glucose (27 g of sugar), citric acid, flavors, and caramel. Energy drinks increase blood pressure, heart rate or alter glycemic levels; these can often prevent normal sleep cycles and may have more serious effect on dehydrated athlete by increasing the heart rate, In 2000, Ross Cooney, a healthy, 18-year-old basketball player from Limerick, Ireland, collapsed on the court and died after drinking four cans of Red Bull before a basketball game, he died as a result of Sudden Arrhythmia Death Syndrome. “gives you wings” is the promises that energy drink companies attract consumers; according to Red Bull, all of the ingredients are synthetically produced by pharmaceutical companies, which “guarantees the highest quality” of ingredients, the company claims the combination of caffeine, taurine, and glucuronolactone will boost energy. The biosynthesis of taurine occurs in the liver through the cysteine sulfinic acid pathway. The mean intake in humans is estimated to be around 60 mg daily. Premature infants lack the enzyme to convert cystine and synthesize taurine and may become deficient in taurine. Therefore, for the premature infant, taurine is a dietary essential nutrient often found as a supplement in baby formulas and baby foods. Most of energy drinks are considered unhealthy for the human body; therefore, these drinks should be watched carefully due to the unbalanced ingredients, especially sugar and caffeine in their compositions. Baum M, Weiss M. The influence of a taurine containing drink on cardiac parameters before and after exercise measured by echocardiography. Amino Acids 2001;20:75-82. O'Brien MC, McCoy TP, Rhodes SD, Wagoner A, Wolfson M. Caffeinated cocktails: Energy drink consumption, high-risk drinking, and alcohol-related consequences among college students. Acad Emerg Med 2008;15:453-60. Ferreira SE, de Mello MT, Pompéia S, de Souza-Formigoni ML. Effects of energy drink ingestion on alcohol intoxication. Alcohol Clin Exp Res 2006;30:598-605. Gunja N, Brown JA. Energy drinks: Health risks and toxicity. Med J Aust 2012;196:46-9. Kennedy DO, Scholey AB. A glucose-caffeine 'energy drink' ameliorates subjective and performance deficits during prolonged cognitive demand. Appetite 2004;42:331-3. Nawrot P, Jordan S, Eastwood J, Rotstein J, Hugenholtz A, Feeley M, et al. Effects of caffeine on human health. Food Addit Contam 2003;20:1-30. Lee WM. 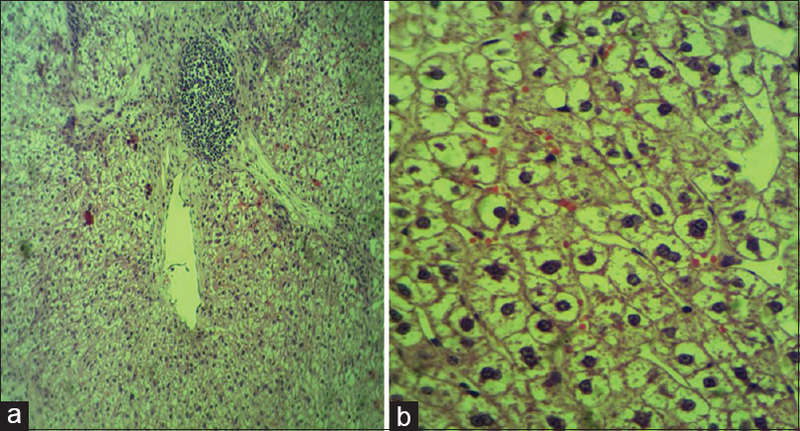 Drug-induced hepatotoxicity. N Engl J Med 2003;349:474-85. Lieberman HR. The effects of ginseng, ephedrine, and caffeine on cognitive performance, mood and energy. Nutr Rev 2001;59:91-102. Malinauskas BM, Aeby VG, Overton RF, Carpenter-Aeby T, Barber-Heidal K. A survey of energy drink consumption patterns among college students. Nutr J 2007;6:35. Militante JD, Lombardini JB. Treatment of hypertension with oral taurine: Experimental and clinical studies. Amino Acids 2002;23:381-93. Reissig CJ, Strain EC, Griffiths RR. Caffeinated energy drinks – A growing problem. Drug Alcohol Depend 2009;99:1-10. Reyner LA, Horne JA. Efficacy of a 'functional energy drink' in counteracting driver sleepiness. Physiol Behav 2002;75:331-5. Rogers NL, Dorrian J, Dinges DF. Sleep, waking and neurobehavioural performance. Front Biosci 2003;8:s1056-67. Rogers NL, Kennaway DJ, Dawson D. Neurobehavioural performance effects of daytime melatonin and temazepam administration. J Sleep Res 2003;12:207-12. Rogers PJ, Martin J, Smith C, Heatherley SV, Smit HJ. Absence of reinforcing, mood and psychomotor performance effects of caffeine in habitual non-consumers of caffeine. Psychopharmacology (Berl) 2003;167:54-62. Ryan L, Hatfield C, Hofstetter M. Caffeine reduces time-of-day effects on memory performance in older adults. Psychol Sci 2002;13:68-71. Savoca MR, Evans CD, Wilson ME, Harshfield GA, Ludwig DA. The association of caffeinated beverages with blood pressure in adolescents. Arch Pediatr Adolesc Med 2004;158:473-7. Smit HJ, Rogers PJ. Effects of low doses of caffeine on cognitive performance, mood and thirst in low and higher caffeine consumers. Psychopharmacology (Berl) 2000;152:167-73. Seifert SM, Schaechter JL, Hershorin ER, Lipshultz SE. Health effects of energy drinks on children, adolescents, and young adults. Pediatrics 2011;127:511-28.